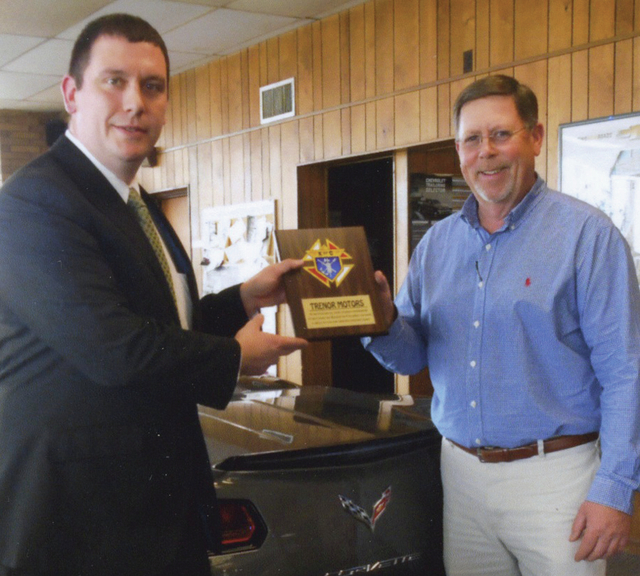 Matt Foster, left, Grand Knight, Urbana Council 1727, Knights of Columbus, presents an appreciation plaque to Roger Tehan Jr. of Trenor Motors Inc. On July 31, the local Knights will hold their Car, Truck & Bike Show at the dealership, 1100 Scioto St., Urbana, as they’ve done the last 12 years. Registration is 4-6:30 p.m. event day. The fee is $10. There will be music, food, door prizes, 50-50 drawing, dash plaques, drivers pot and Largest Participating Club award. For more info, call Matt, 609-864-0611, or Chuck, 937-215-2666.
https://www.urbanacitizen.com/wp-content/uploads/sites/36/2015/07/web1_koc.jpegMatt Foster, left, Grand Knight, Urbana Council 1727, Knights of Columbus, presents an appreciation plaque to Roger Tehan Jr. of Trenor Motors Inc. On July 31, the local Knights will hold their Car, Truck & Bike Show at the dealership, 1100 Scioto St., Urbana, as they’ve done the last 12 years. Registration is 4-6:30 p.m. event day. The fee is $10. There will be music, food, door prizes, 50-50 drawing, dash plaques, drivers pot and Largest Participating Club award. For more info, call Matt, 609-864-0611, or Chuck, 937-215-2666.